Tegaderm Transparent Film Dressing 3M - 4" x 4-3/4"
3M™ Tegaderm™ Transparent Film Dressing is a transparent film dressing used to cover and secure I.V. sites to protect at-risk skin, or as a primary or secondary dressing over acute wounds, surgical sites, and chronic wounds. Available in a variety of sizes and shapes. 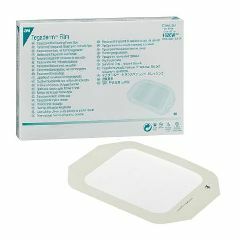 Tegaderm™ Film has a "frame" and "first aid" delivery system that makes placement quick and easy. Breathable film provides a bacterial and viral barrier to outside contaminants. 3M offers two, unique, different transparent adhesive dressing systems (standard and HP), giving the clinician a choice for patients with sensitive skin or a need for increased holding power in the presence of moisture. Laboratory testing has proven Tegaderm™ and Tegaderm™ HP dressings provide a viral barrier (HIV-1 and HBV) while the dressings remain intact without leakage. Sterile, waterproof dressing provides a bacterial and viral barrier to outside contaminants and allows the patient to shower. The dressings are available in a variety of sizes and shapes to address both wound and I.V. applications. Frame delivery system allow maximum versatility as it can be applied quickly and easily. The hydrophilic nature of Tegaderm™ Film adhesive makes it adherent and useful in sensitive skin situations. Transparent dressings allow easy monitoring of wounds without the need to remove dressing. This product acted like it was not as fresh as the same product I purchased at my local pharmacy. The paper ring around the edges that you remove after placing over the wound would stick to the product and pull it off the skin. After doing this it was wrinkled and very difficult to straighten. The locally purchased product hat two slits to remove the outer edge. Only one cut to remove edging. Could be an older product. Cannot recommend this to use in difficult to reach area such as the upper thigh. We have ordered this product and similar products from Allegro. Good prices. Good service. Great invention to keep wounds dry while healing. Recovering from partial knee replacement and must keep incision dry for 2 weeks. Great for vac systems. Long Term Use. Isolating stoma wafers. Keep In The Medicine Cabinet. Bed sores. Novice First Aid Skills. Caregiver. Take care of my mother 89. I used on my mother for bed sores and they have healed nicely. Is it hard to remove? Does it tear skin when removed? this does not tear the skin. Its really nice for bed sores, it keeps them dry and you can see thru them to see how they are healing. They go on very easy once on they look and feel like plastic wrap. Removed easily. I used baby oil or bandage adhesive remover to clean up residue. Will this product tear thin skin? Can Tegaderm be used as a sticking aid for morphine patches? Answered on Dec 17, 2012 7:32:01 PM by Suny from Ct.
Can I use this to cover an IV line (or Pic line) when I shower? Is Tagaderm covered by Medicare or other insurance?